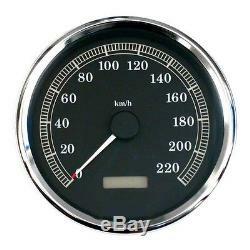 Reproduction of the meter in km / h. Softail from 1996 to 1998. 2536 Sisteron Road 13100 Aix en Provence. 04 42 96 25 40. The twin power sarl is in no way affiliated with the harley davidson company. The use of the word "harley davidson" on this site serves only as a reference. To read imperatively before any purchase. We work on order, so you need to know that we do not have all the items offered in stock. However, we are delivered every day (Tuesday to Friday). Shipping times can vary from two days to twenty days for items from the United States. Thank you for considering this note. Thank you for reading very carefully the ads, to take into account all the measures given, the different models and years of motorcycles. Please also consider the material provided or not, indeed some objects require media to be taken in photos, but they are not sold. If you have any doubt about the compatibility of a part with your motorcycle model, thank you to ask your questions before buying. We answer questions daily, morning and / or evening, except Sundays and Mondays. After buying an object you have 7 days to send us the payment. Please note the accepted payment methods, ie. Possibility to pick up the article in store. For payment by check, please include your name, address, delivery address and the number and title of the object. Once the payment is received, the package is sent within 24 hours of availability (unless an item is settled on a Saturday afternoon). Packages are mailed from Tuesday to Saturday inclusive, not send on Monday. For this you have to wait until I send you the payment information. If you adjust before, we will not be able to do anything. All our packages are carefully packaged, so we are not responsible for the awkwardness of. It is the responsibility of the buyer to follow his shipment and not to us. In case of real delay (more than 2 working days, except dom-tom), you can contact us for us to file a claim with. As an indication, in case of loss. Reimburses at the rate of 23 euros / kg. So if this happens we will refund the purchase only on the basis of this amount. Insurance remains optional when buying an object and entirely at the expense of the buyer. If for some reason an error occurs when sending an object (example: two pots before instead of a front and a back), it is obvious that you can return the object and the return costs will be at our expense If an item is defective, we accept the return but the costs will be borne by the buyer to the extent that the objects are new and in their original packaging (they are therefore neither open nor tested). If the buyer makes a mistake when ordering example: wrong size or year etc ..., the object will not be taken again. If a buyer is really not satisfied with the quality of an item, we open a return against the object at the expense of the buyer, no refund. All our parts, accessories, helmets etc. Are not approved (standard nf, highway code etc), nor guaranteed. The responsibility for their use will rest with the buyers. Many of our items are new products, so as their name indicates, they are products that are at least 20 years old or older. It is often a plus at the qualitative level, but can also be a less at the level of the chrome that can sometimes be cleaned. Read this, if you do not agree with any of these conditions, please do not make a purchase. The item "harley davidson softail type counter 1996 to 1998" is on sale since Wednesday, March 25, 2015. It is in the category "auto, motorcycle parts, accessories \ collectible motorcycle \ parts \ harley-davidson \ parts". The seller is "hibiscus7676" and is located in France. This item can be delivered anywhere in the world.